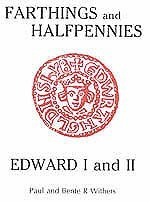 Medieval English Hammered Farthings: Edward I - Intro. BACKGROUND: Between 1275 and 1278 the state of the English coinage was in crisis - inflation was severe, foreign trade was in decline as traders would not accept poor quality English coins, and a majority of coins had been clipped. In response to the crisis, on 17 November 1278 all the Jews in England were unexpectedly seized and imprisoned on the charge of coin clipping. Immediately after, all goldsmiths and others suspected of encouraging the clipping of coins were arrested. Finally, the net was closed and all mint officials were arrested. The Jews who were found guilty of coin clipping were severely fined and between 30-50 were hanged (M. Mate, BNJ '72). THE RECOINAGE: In 1279 Philip de Cambio, the chief moneyer, was accused of adding more than the legal amount of alloy to the silver from which he made money and the assayers, William Harlewyn and Thomas de Brancestre, were accused of collusion by accepting his coins which they ought to have rejected as false. Both Philip de Cambio and William Harlewyn were drawn and hanged, while Thomas de Brancestre and a number of other guilty mint officials were able to escape death by claiming clerical status. Edward I, in carrying out his recoinage of 1279 had to address two main concerns: restore state of the currency and replace the mint officials with trustworthy men. On 7 January 1279, the king appointed Gregory de Rokesle (a leading London citizen) and Orlandino de Podio (principle attorney to a powerful Italian financial house) as Warders of the Exchange. Moneyers were brought over from Europe - William and Peter de Turnemire (from Marseilles) and Hubert Alion of Asti (of whom no record exists in the mint accounts, so probably failed to take the position). A Florentine, Boniface Galgani was appointed as Principle Assayer. To avert a repetition of the monetary crisis of 1278, the king made several improvements to the coinage. In 1279 round farthings were introduced to general circulation, and when these proved popular, he started coining round halfpennies in August 1280. Cut coins were withdrawn from circulation and the practice of cutting coins illegally became obsolete. PRODUCTION EXPANDS: The recoinage required far more resources than the London mint could provide, so with this in mind and to facilitate the exchange of new money, five provincial mints were opened in 1280. Each remained under royal control, with a local Keeper of the Exchange overseeing operations: Bristol (Peter de la Mare, opened early in 1280); York (John Sampson and John le Specer, opened June 1279); Lincoln (opened mid-1280), Newcastle upon Tyne (opened mid-1280); and Chester - to serve the marches of north Wales (opened December 1280, but never produced farthings). On 8 January 1280, William de Turnemire was promoted to Master of the King's Money, responsible for making money in four places: London, Canterbury, Bristol and York, with a Master Moneyer under him in each of the provincial towns. With consolidation of the Royal mints under Turnemire, he introduced new minting techniques. The 1279 farthings were struck on square blanks, cut from a sheet of silver, that were then separated from the blank by means of a cutter of the correct diameter for a farthing. In 1280 he introduced a process of pouring molten silver through a sieve and the drops of silver that were produced (of correct and uniform weight) would solidify as odd shapes in a tub of water. The perfect roundness of the 1279 farthings is quite recognisable from the later type. Over 4 million Edward I farthings were produced, but their tiny size made them easy to lose and very difficult to find. While use of metal detectors has put these coins within the reach of most collectors, they remain scarce items. J.J. North made a significant contribution to the classification of these farthings, identifying over 18 specific types/classes derived from his study of contemporary pennies. Unfortunately, as more examples are found, it is difficult to match coins to only one type, or there are many variants within each grouping. Recent research by Withers has re-assessed these groupings, and now it is possible for most Edward farthings to be classified into one of nearly 100 types and sub-types. during the reign of Edward I? What did a farthing buy during the reign of Edward I?